Master of Alchemy: our first iPad game! We’re really proud to introduce our first iPad game: Master of Alchemy. 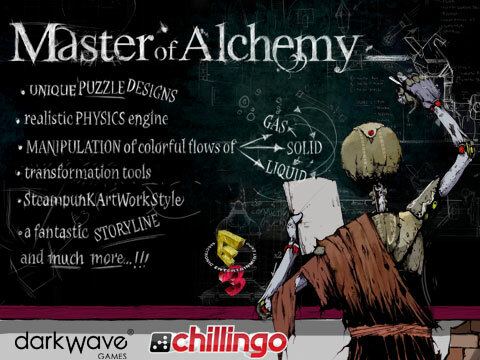 Master of Alchemy is an iPad game developed by DarkWave Games and published by Chillingo – Coming very soon on app store. We are really proud of our game: it is being presented at E3 Expo 2010. Master of Alchemy is an original and engaging puzzle game based on the manipulation of solid, liquid and gaseous elements. Substances’ streams are characterized by a realistic behavior, because of the implementation of a physics engine. So, like an alchemist, player creates new substances, starting from basic elements characterized by different colors and by the three material states. In detail, player has to manage a small alchemic laboratory that is equipped by an increasing number of instruments (alembics – like crucibles, pipes, coils, blenders, steam engines, condensers, etc.). Thanks to these tools, he can blend, fuse, sublimate, condense or break up elements, according to the targets and limits/obstacles of levels. In background to the various levels, there is the history of Master of Alchemy: the war between the two factions of the setting (alchemists and mechanologists – the machine-oriented scientists). At the beginning of MoA, player has to choose which alchemist to perform (among a group of six characters). During the game, his alchemist evolves. moving physics obstacles – buttons, hot air balloons, gates, big solid blocks, etc. presented at E3 Expo 2010. 60 levels – hours of fun! Today Davide shows to me this link to a new opensource project regarding Flash. I immediately downloaded the available “alpha” release and made a first test.. I don’t know if the project is still alive and which is the developement status, but it looks very promising.